Our three Range Rovers, VELAR YVB 158H, Early Production Vehicle ELA 830J and CSK J32 PRW have been delivered to our stand thanks to the excellent Straight Eight Logistics, and a selection of our expert staff are embarking on a first day on the show floor of this weekend’s Lancaster Insurance NEC Classic Motor Show (website). 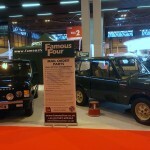 The show runs from Friday 13th to Sunday 15th and is one of the UK’s premier classic car events. We’re really excited to be exhibiting at the show and using such a great stage to showcase our restoration and workshop capabilities. 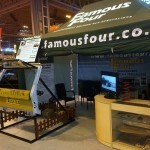 If you at the show, drop by stand 2-260 to see our excellent vehicles and chat to our knowledgeable members of staff. We look forward to seeing you there!